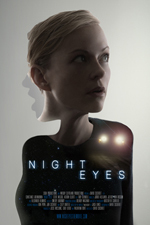 Night Eyes, the Hollywood feature movie directed by David Cocheret, based on the novella by Jack Lance, premieres on 4 November 2014 at the JT cinema in Hilversum, The Netherlands. It will be a special night for invites only, and among the attendants will be Constance Brenneman (who plays Linda Raines, the main character in the movie) and Steve Wilcox (playing Michael, the second main character in the movie). The opening ceremony of this world premiere will be done by the Mayor of Hilversum, Mr Broertjes. From 6 November onwards the movie will run for at least a week in the same cinema (address: Langgewenst 20, Hilversum), for all of you wanting to see the movie. More cinema’s where the movie will run are to be announced soon. In Night Eyes, Linda Raines drives home one day and is more than just a little astounded to see her car – the car she’s sitting in this very moment – parked in front of her house. Night Eyes moviepage on Jack Lance.com.